"Love you to the moon and back." How's your summer been so far? Mine has been awfully busy with swim team practice, diving class, swim meets, playdates - all the usual fun summer stuff - which is why I haven't spent much time here on the website lately. But with my son way at camp all this week (a Parkour camp - is that cool or what?) I've finally found some free time to get a little work done! 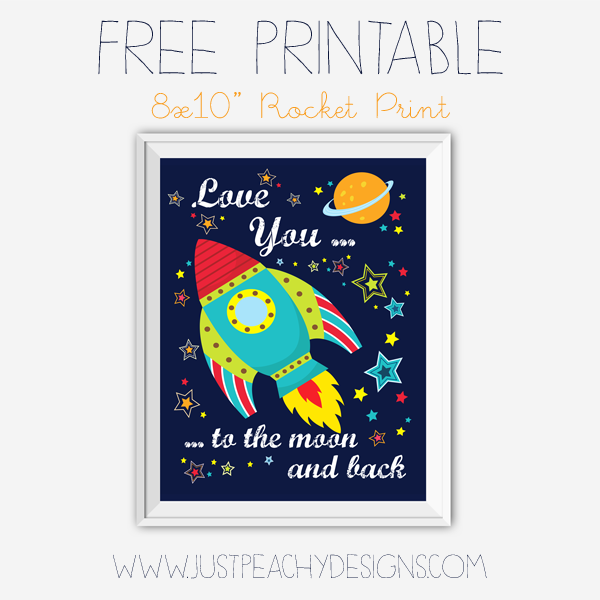 So here's a new freebie for you - an 8x10 inch printable featuring some adorable rocket and stars graphics. It would be perfect for a baby nursery or child's room. As usual, just click the image above to download - then print and frame. Hope you like it! Aww this is cute, I love the colors! Thanks for posting. Hello from Create Link Inspire.